Three movies featuring the work of stop-motion legend Ray Harryhausen. Growing up as a child in the '70s and '80s meant there were only two movie options on TV on bank holidays - either turgid biblical epics or Sinbad movies, the latter films full of wonder and adventure with amazing creatures that moved spasmodically but packed with emotion and expression, something that most of the leading men in these movies conspicuously lacked. It was these films that sparked a lifelong interest in special effects and the art of make believe. So powerful is the Ray Harryhausen brand that it supersedes that of the director. Is there any other special effects wizard that could be compiled in box set form? Following on from Powerhouse's nifty Sinbad box set, they have now compiled the first of a two-volume set. This contains three of his earlier works, when the Harryhausen brand was not fully established, so you get two sci-fi programmers and a slightly castrated version of Gulliver’s Travels for your money. It Came from Beneath the Sea is arguably the lesser of the three films on offer. Full of clunky dialogue and stock footage, with barely a line of dialogue that doesn’t have the word atomic in it. The giant Octopus is the big draw here (in truth more of a Sextopus) but it is the bizarre psycho sexual dynamic of the three main actors that is of more interest to modern eyes. When a Nuclear Submarine is attacked by a creature of unknown origin, the commander of the ship, Pete Matthews (Kenneth Tobey), seeks the help of a crack duo of marine biologists Lesley (Faith Domergue) and John (Donald Curtis). In between working out and tracking the creature, Pete spends the majority of his time hitting on Lesley, while at the same time seeking the approval of John to get it on. John's relationship with Lesley is a slightly uncertain one. Are they lovers? Colleagues? Mentor and student? That it comes across as a three way with a cuckolded John getting his rocks off while the more studly Commander gets it on in front of him, I am guessing, was not the intention of director Robert Gordon. Gordon was a jobbing actor and director and the flat staging and relatively slow pace make it a bit of a chore in places. Harryhausen's work is used sparingly but effectively. 20 Million Miles from Earth shows how far his craft had improved in two years. A manned mission from Venus (A place that is hard to breath in according to one astronaut!!!) crash lands in a Spain full of 'speaka the lingo' foreigners straight out of stock casting. A pure slice of '50s pulp science fiction, this at least has a director who has a history in the genre and also made one of the best of the Sinbad movies with Harryhausen. It may move all over the place - is it an alien plague movie, a sympathetic monster film a la King Kong or just an excuse for a rampaging monster to be taken down by an American military eager to show its might to any putative communist uprising? The monster has that timeless Harryhausen quality, being both emotive and empathetic as well as expressive; looking at times like a pissed off Lorax just adds to its charms. A straight forward B picture then but one which for all of its militaristic posturing falls on the side of science and pacifism. The 3 Worlds of Gulliver offers little in the way of spectacle for fans of stop motion, save for a crocodile and killer squirrel, and feels torn between a prestige adaptation of a classic satire and a children’s’ film (which in truth it works far better as). This is also possibly the first and only instance of film characters eager to return to the delights of Wapping. There is a nice line in absurdism, and it moves at a fair old clip but has a charisma vacuum where its leading man should be. Gulliver should be a quintessential English man of medicine, not a blandly chiselled American not even attempting to hide his accent. Luckily the Lilliputians and Brobdingnagians do most of the heavy lifting. It has a sense of fun and whimsy, and if the gentle absurdism of the first half is the high point, the slightly turgid second half at least highlights the stop motion that fans want to see. Something of a square peg in this collection but worthy of reevaluating its somewhat tarnished reputation. Spanking restorations of all three films as well as colourised versions of the two monster movies for the hard of thinking. The extras are an abundant feast and arguably a bigger draw than the films themselves. Both Sea and Earth have archival commentaries from the man himself, while Gulliver comes with an isolated Bernard Hermann score. Add to the mix interviews with filmmakers and devotees Joe Dante and Aardman Animation as well as special effects wizard Dennis Muren. Indicator don’t stint on the archival effort either with documentaries, interviews and featurettes, as well as still slideshows and poster art. Also included is an 80-page booklet with new essays by Kim Newman, Dan Whitehead and Charlie Brigden. This is the definitive collection of Harryhausen's work and is essential for anyone who wants to relive their childhood. These may be minor entries in his oeuvre but no stinting has gone into making this the most comprehensive overview of his early work on Blu-ray. If Volume 2 keeps to this standard it will be something special indeed. 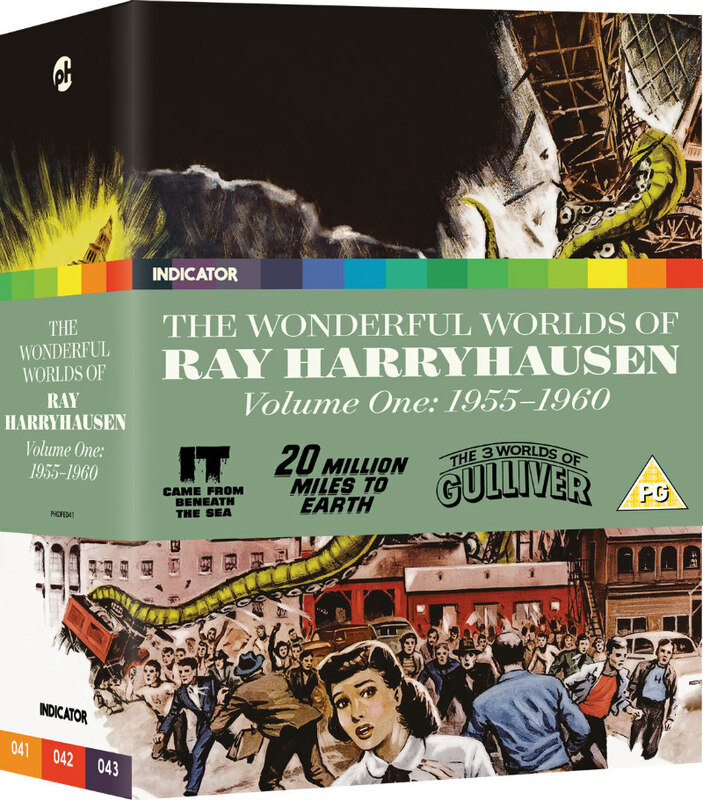 The Wonderful Worlds of Ray Harryhausen: Volume One (1955-60) is available on blu-ray now from Powerhouse Indicator.